With Galway Film Fleadh favourite ‘Pursuit’ hitting cinemas on September 18th, IFTN chats to writer/director Paul Mercier about bringing the old Irish legend of Diarmuid and Grainne to the big screen. The film, produced by Anne Gately of An Pointe Productions, makes for a contemporary myth about the pursuit of power, class, love and the chance to start again. Ruth Bradley and Barry Ward star as Gráinne and Diarmuid respectively and the ensemble cast also includes Liam Cunningham, Brendan Gleeson, Owen Roe, David Pearse, Dara Devaney, Dónall Ó Héalaí, Ciarán O’Brien and Emmet Kirwan. Here, Mercier talks to us about his fresh and darkly funny take on the age old legend, the pursuit of funds for the project and the fantastic cast he assembled. IFTN: First off, can you tell us a little about what prompted you to look at the age old tale of Diarmuid and Grainne as film material and put your own modern spin on it? So can you tell us a little about the pursuit of funds for this film – was it difficult to raise the finance? Would you be excited at all by the international prospects of ‘Pursuit’ – you have a cast of internationally renowned actors and a fresh, original take on a mythical Irish legend – has there been any international interest yet? And I see TV3 are involved in this production too? 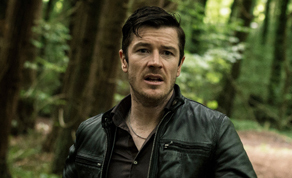 ‘The Guarantee’ – another film that TV3 backed last year – also had a cinema release before being broadcast on the channel – will ‘Pursuit’ follow a similar path? At this stage, your own filmography reveals a very eclectic range from ‘Studs’ to ‘Aifric’ and now ‘Pursuit’…. On that note then, what is next for you? Are you working on any other projects or are all your efforts concentrating on getting ‘Pursuit’ out there for the minute?